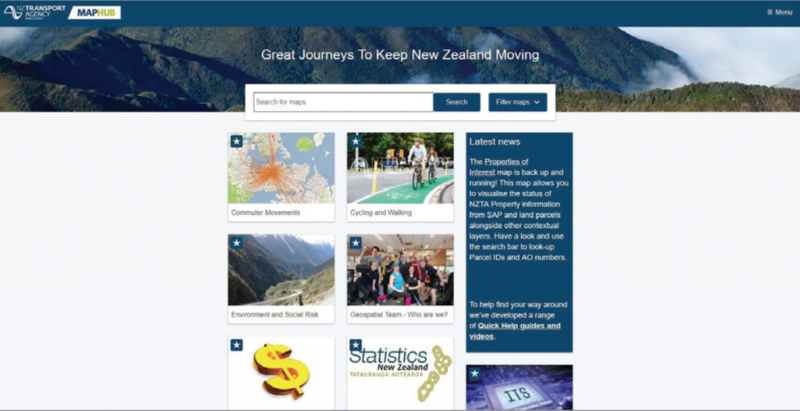 GBS supported the NZ Transport Agency (NZTA) with the design, development and release of MapHub, a solution comprised of a range of user-focused mapping capabilities based on Portal for ArcGIS (Portal) and integrated with new Geospatial Enterprise Framework. The MapHub solution provides NZTA with a centralised portal of geospatial information and enables their business to create a range of purposeful maps and applications which support evidence-based analysis. Since the original launch in October 2014, GBS and NZTA have released a number of new enhancements (MapHub 2.0 in 2017 and smaller functionality releases in 2018). The NZTA is a Crown entity with 1400 staff working in 14 locations across NZ. Their purpose is to deliver transport solutions for New Zealand on behalf of the government which makes every New Zealander their stakeholder. Managing the use of the transport network and monitoring the performance of the transport network so this can inform future strategy and planning. In 2012 the NZTA initiated the Common Geospatial Capability (CGC) project with the objective to deliver a suite of best practice geospatial capabilities, processes, tools and data to support the NZTA’s current and future strategic business priorities. GBS was a part of the NZTA’s geospatial suppliers’ panel, in collaboration with other organisations, and was tasked with establishing the detailed design and implementation for the geospatial web based user tools. The original solution implemented by GBS leveraged and extended Portal 10.2.1, where bespoke application tools were developed along with a custom Portal home page. This solution was successfully released into Production in August 2014 as MapHub 1.0. An enhanced MapHub 2.0 solution subsequently went live in September 2017, including additional functionality as well as some modifications. MapHub is now running on ArcGIS for Enterprise 10.5. During the initial requirements gathering phase of the MapHub 1.0 project it was identified that the NZTA were clear on their high-level requirements, and wanted to work more collaboratively with GBS to clarify and confirm the detailed requirements. As NZTA had very tight project delivery timeframes, GBS took a flexible approach and introduced a Proof of Concept (POC) methodology. Development was started in alignment with the project schedule, where functionality with confirmed or high-risk requirements were prioritised to be developed first. This allowed the NZTA to continue on the remaining detailed design, whilst GBS still made the required planned progress on development tasks in parallel. Supports NZTA’s strategic direction and priorities. Enables NZTA staff to engage with stakeholders from a credible position of knowledge and capability. Enables better decision-making based on geospatial evidence. Empowers NZTA staff responsible for analysing the Network and sharing this story with stakeholders to fulfil their roles more effectively and efficiently. MapHub provides web application users with a powerful range of out of the box and customised tools. MapHub allows the NZTA to host all their applications in a professional centralised portal. MapHub is integrated with other NZTA business systems including their Road Runner application which allows users to view videos of road inspection and its corresponding location in a web map. NZTA is no longer limited to a single map viewer, cluttered with geospatial information. MapHub provides NZTA with a set of foundation templates to create and configure an unlimited amount of web applications with specific tools and information for targeted use. Users are able to perform unrestricted searches across all geospatial Portal items to see what data is available. MapHub 2.0 encompassed the development of custom components as part of the NZTA Geospatial Capability Project (Phase 2). Initial on-site consultation for requirements gathering for the high level design. A detailed design and fixed-cost price for the full implementation. Development of web-based user tools including: – A custom MapHub search site – Custom Web AppBuilder theme – Custom Portal functionality – A reuseable Portal custom web mapping template; and – A number of custom widgets, extensions and tools. Project management of GBS resources using GBS Prince2– based methodologies integrated with NZTA’s requirements and processes. 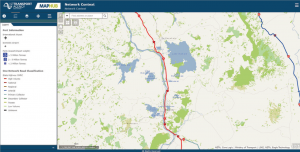 Collaboration with other suppliers to deliver the overall Esri solution e.g. Eagle Technology, e-Spatial and QualIT. Training and handover to NZTA Portal administration staff, to enable them to maintain and administer Portal, and create and publish applications as required.